Cellulite reduction (marked visual improvement of (orange peel syndrome) can be achieved using Smart Liposuction to remove fat deposits and laser to effectively free fibrous bands. During the procedure, sub-dermal Laser energy heats and thereby triggers the production of collagen following the procedure, which tightens skin as well as increasing skin’s elasticity. Cellulite Reduction can be achieved with Smartlipo Cellulite Liposuction! In order to treat Cellulite problems, pockets of fat need to be removed in conjunction with loosening tissue bands beneath the skin which pull on your skin and cause the rippling effect of cellulite. 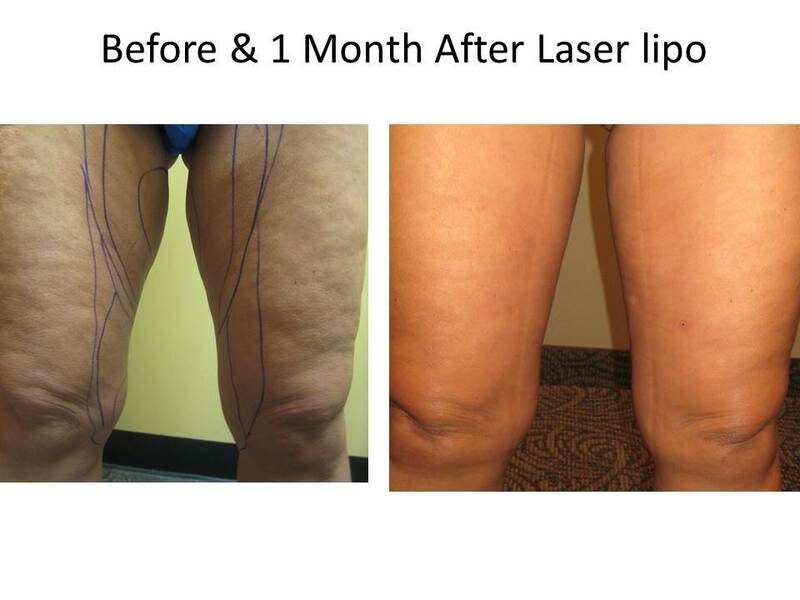 Dr. Goodman has been performing cellulite reduction procedures for years with a proven technique using laser and laser liposuction and has perfected the process. Why do I have cellulite… it’s not fair… I exercise and eat right? So how does cellulite happen? Cellulite is now thought to be a problem which arises due to micro-circulation deficiencies. As a result of insufficient micro-circulation to areas of normal fat storage, toxic metabolic by-products cannot be effectively cleared from the cells and therefore spill over into the inter-cellular space and stimulate scar tissue fibrous banding as a result. It is known that most females have compromised blood flow or micro-circulation issues in areas such as the outer/posterior thighs and also develop cellulite there. Micro-circulation problems lead to irregular fat deposits and fibrous bands. These fibrous bands in turn pull on the skin contributing to the surface irregularities seen visually as cellulite dimpling and skin irregularity. There have been many ‘cures” for cellulite over the years but to date nothing has worked as well as this procedure. With cellulite, fat must be physically removed and the bands freed for any real results to be experienced. Removing fat in conjunction with freeing the bands, which create the dimples, allows for immediate reshaping of the thighs, restoring a more youthful and sculpted appearance. Additionally, this also allows for the restoration of blood flow, micro circulation and improved lymphatic drainage. During the procedure fat is physically removed so fat cells are gone from the problem areas and with fat cells gone they cannot grow back. This prevents cellulite from coming back and is much more effective than shrinking the fat cells through exercise. Dr. Goodman offers a more complete solution*. By removing the pockets of fat which are the causes of the dippling in cellulite as well as providing collagen generation and contraction, Smart Lipo smoothes and tightens the skin, thus helping to rid treated areas of cellulite and dimpling. The results in terms of cellulite improvement are impressive. What is Cellulite? Cellulite is a skin condition and it appears when fat cells just under the skin swell or enlarge and the collagen bands become brittle and no longer stretch properly. This causes the dimpled skin known as cellulite. The treatment uses dynamic laser energy to liquefy fat in the enlarged cells, and repair brittle collagen. Collagen is regenerated, circulation is improved and metabolic processes are restored. The process removes liquified fat and smooths the appearance of the skin. If liposuction is not for you, you need to see the newest Non-Invasive technology in Cellulite Reduction – Viora Reaction! Backed by the support of doctors and clinical researchers worldwide, the Reaction™ system features a patented, premier technology known as CORE™(Channeling Optimized RF Energy), offering 3 distinct RF frequencies as well as an innovative 4th dimension – multi-channel mode – that simultaneously incorporates all three frequencies for a full scope treatment. The system also combines vacuum therapy which maximizes the penetration of RF energy in the treatment area, increases local blood circulation, stimulates lymphatic drainage and assists in the shrinkage of fat cell volume. The Reaction™ aesthetic system offers medical and aesthetic practitioners a chance to improve how the future looks with the world’s leading system for body contouring & skin tightening, now FDA cleared1. Lose your stomach, waist or love handles during Lunchtime! – SculpSure melts stubborn fat without surgery or downtime and has been proven to eliminating a higher percentage of fat than CoolSculpting. * SculpSure treats over 3 times more fat than CoolSculpting does for the same cost and it tightens skin too, something that CoolSculpting doesn’t even claim to do. In only 25 minutes you can get SculpSure Laser fat reduction in Palm Beach. Getting skinny has never been simpler! By incorporating our SculpSure™ advanced protocol which combines multiple treatments into your treatment at no cost to you, we can achieve more pronounced results, faster with up to 60% more fat loss* than with SculpSure alone. This is just one of the reasons why we are Florida’s top SculpSure clinic. How Will My Exilis Ultra™ Treatment Feel? Exilis Ultra™ puts your comfort first by optimally cooling your skin during the entire treatment. The fat loss results come from Exilis Ultra’s™ radiofrequency energy that is set so the heat is targeted only to the parts of your body that need skin tightening and fat loss. Due to this advanced cooling, Exilis Ultra™ is safe to use on all the body parts you want to sculpt, even your face! Most patients describe the sensation like a hot stone massage that gently glides over your body.